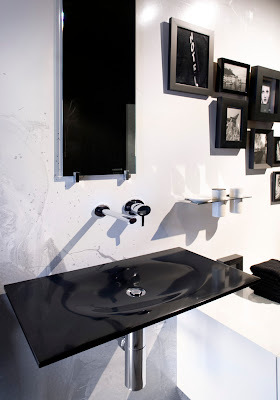 Launched in October 2011 The Puddle® washbasin in black is a newlook for a Minosa classic that’s now offered in nine different hues. The Puddle® is individually handcrafted in Sydney using sophisticatedsolid surface CorianTM by DupontTM - the high performance, low maintenance material of choice for Minosa. Headed by Darren Genner and Simona Castagna, Minosa is an innovative Australian design company who design and over seethe local boutique manufacture of premium quality washbasins and bathroom furniture. Their other forte is stand-alone design concepts for bathrooms and kitchens. · Ultra unique, sleek sculptural design that’s also functional and water efficient. 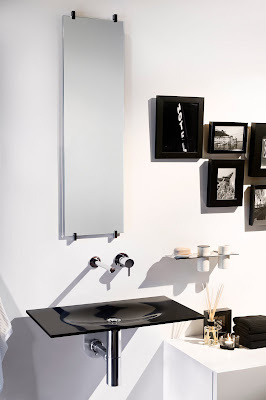 · Black brings to a bathroom or powder room space a striking sensuality, sense of luxury and a strong visual, high impact look that’s enticingly different. · The intelligent design, works in conjunction with Minosa’s water saving technology which reduces tap waterflow from a commonplace industry average of 20 litres per minute to 4-6 litres per minute. · The subtle bowl depth plays on the logical expectation that splash will occur. Conversely Minosa were one of the few company’s worldwide to pioneer the design of splash free shallow basins by incorporating their reduced waterflow innovation and with that the idea of using only the amount of water required for function . · Made from non porous, premium material CorianTM by DupontTM - a material that offers unparalleled hygiene; durability; stain, mildew and chip resistant qualities; and repairability if needed. · Each basin is hand crafted to exacting standards by a team of local artisans and manufacturers under the watchful eye of the designers. This produces exceptional quality and a short lead-time with a reliable delivery date (10-15 business days) that can be scheduled into your project. · Proudly Australian design and manufacture to produce product that stands on its own in leading edge design, quality and performance while supporting local industry. · Virtually maintenance free – the product is easily cleaned with a cloth or sponge and warm soapy water, or more stubborn stains, use a mild abrasive cleaner. · Colour choice includes: Black (new Oct 2011), Cameo White, Canvas, Concrete, Fossil, Glacier White, Jasmine, Rice Paper and Venaro White. · The Puddle is supplied complete with Dry Seal, Chrome Fixed waste with 32mm thread, O Ring, Chrome Spacer and Locknut. · Personalised service direct with the designers and a 3-year limited warranty. · A timeless choice for residential or commercial project application, where exceptional quality and an individual style is appreciated by the design aware.